It may be the giant “EAT” sign outside that draws you in, but Clanton’s is the real deal, and you see it as soon as you step through the door. Lively chatter between diners and the staff create an ambiance of familiarity. People know each other here. And yet, a stranger from the road is welcomed just like a neighbor! Clanton’s has been a family-owned restaurant in Vinita Oklahoma since 1927, and in fact, is the oldest continually owned family restaurant on Oklahoma’s stretch of Route 66. Generations of Clanton’s have prepared meals for their neighbors and welcomed weary travelers on the Route. The restaurant has been featured in Gourmet Magazine for its outstanding Chicken Fried Steak, but pretty much everything on the menu is delicious comfort food. 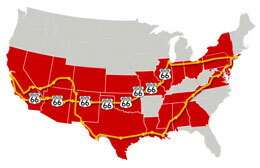 The restaurants founder, Sweet Tater Clanton, opened the place when Route 66 was new, and the road was not even paved. Local lore is that he used to bang pots and pans together to attract passing motorists’ attention in those early years. 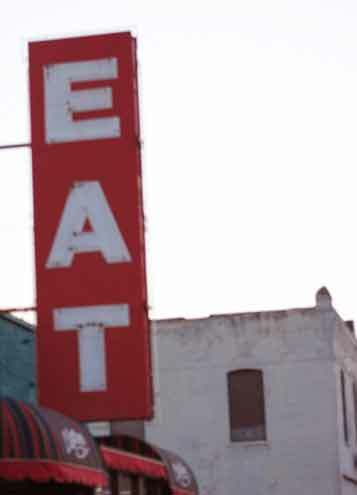 These days the giant “EAT” sign, and the cafe’s reputation attract plenty of diners. 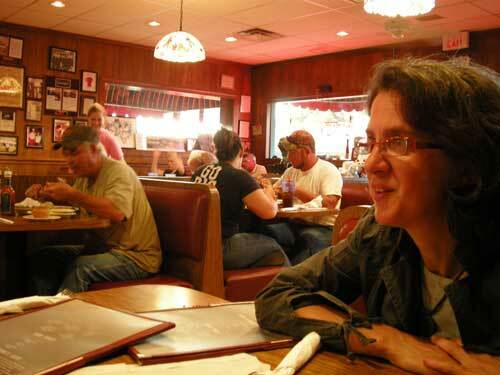 The place is crowded with locals enjoying a broad selection of home-style meals at very reasonable prices. And the great service and convivial atmosphere make it a place you want to come back to. Details: CLANTON’S CAFE (website): 319 E. Illinois St., Vinita, OK 74301 | Phone: 918.256.9053 | Open 6 a.m. to 8 p.m. Monday through Friday, 7 a.m. to 2 p.m. Saturday and 11 a.m. to 2 p.m. Sunday. This entry was posted on Wednesday, July 14th, 2010 at 10:20 pm. It is filed under Practical Matters and tagged with americana, nostalgia, oklahoma, restaurant, route 66, tourism, vinita. You can follow any responses to this entry through the RSS 2.0 feed.